​2018: SIRENS - Round 3 Highly Commended - Single Commercial Category. 1996: New York Festival - Winner, Best of Category (Public Service). Australian Golden Stylus - Best of Category. 1994: RAWARDS Category Winner: Best Commercial. 3 x Australian Golden Stylus Finalists. 1993: Australian Golden Stylus - Best of Category. 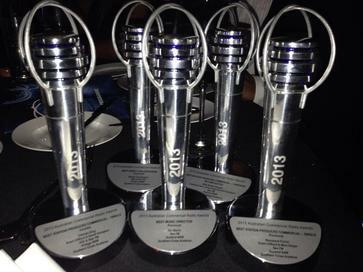 Australian Golden Stylus - Most effective Aust radio advertising campaign. 5 x Australian Golden Stylus finalists. 2 x FARB RAWARD finalists. 1992: Australian Golden Stylus Winner. 1991: Local Government Excellence in Media Communications Award. 2002: University of Central Queensland Bauhinia Literary award. Wannabee Publishing Short Story Award - 2nd prize. 2001: University of Technology Short Story Anthology Award. 2000: Tom Howard Short Story Competition Highly Commended. The Chronicle Open Short Story Awards - 2nd prize.